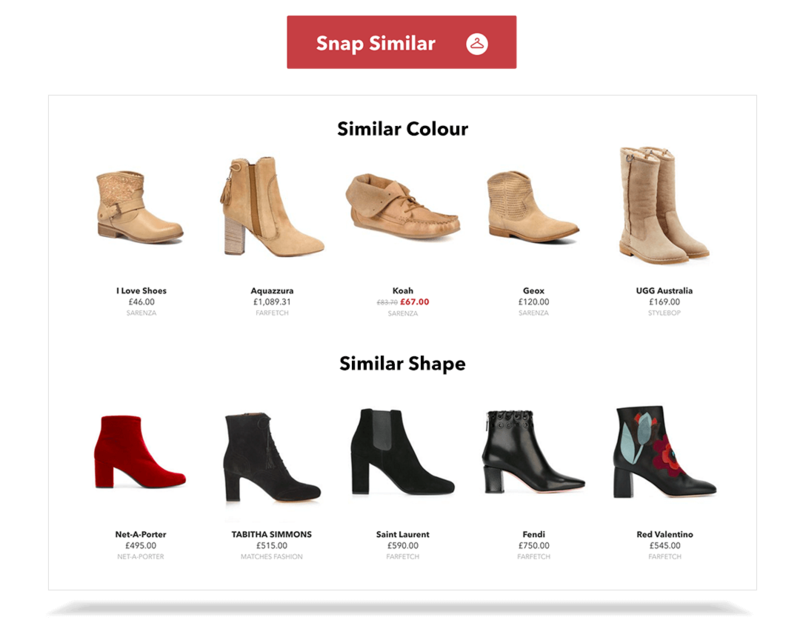 Snap Fashion is the first image-driven shopping website and app. Take a photo of a look you love or take inspiration from Instagram. Our clever tool will scan the latest fashion collections to find the perfect match or look-alike clothes ready to buy now. With thousands of clothes from more than 250 retailers available at the click of a button, you can shop direct from the Snap Fashion website or on-the-go using our mobile app. With so much fashion inspiration on the street and online, your personal style is constantly evolving. The Snap Fashion website and app let you spread your search far and wide for the perfect new piece thanks to our ever-growing catalogue, featuring hundreds of thousands of clothes from brands you may never have considered before. Retailers include street favourites such as Topshop, New Look, Gap and French Connection, eclectic department stores like House of Fraser and Selfridges. and top e-tailers including Asos, Net-A-Porter, Mr Porter, Farfetch and Boohoo, so there’s something to suit every budget. The most flattering cuts and perfectly matching clothes are just a click away. 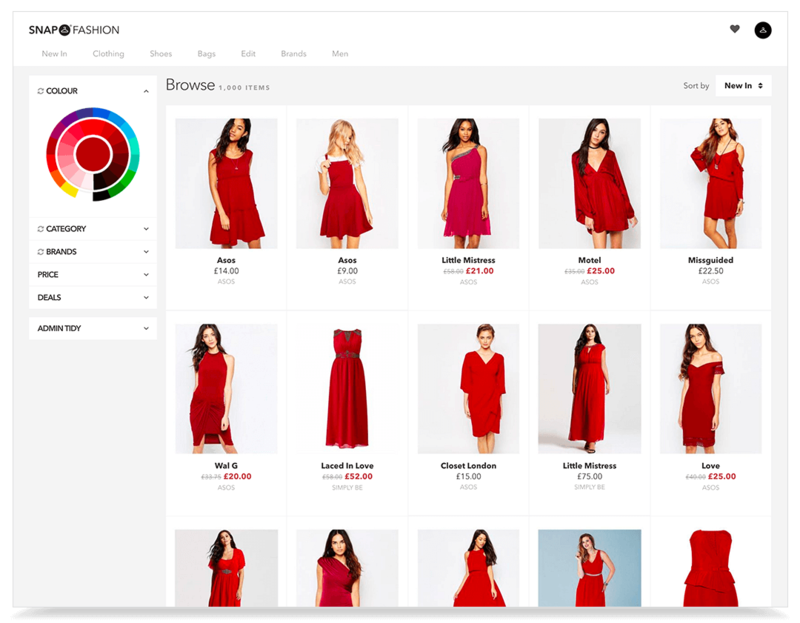 Tap on the Snap Similar button to search for clothing by colour or silhouette, so there’s no more wading through hundreds of red dresses to find the ideal fit and hue. This tool is ideal if you’re taking inspiration from the red carpet but don’t have the cash to splash designer clothes, finding you copy-cat looks on the high street without busting your budget. Visit our Browse page to view hundreds of thousands of products from over 250 top retailers. If you’re looking for fashion inspiration rather than a specific item, our Browse page is ideal. There’s a selection of must-have clothes from more than 250 top retailers, allowing you to step out of your comfort zone and consider shopping from new brands. You can use the colour wheel to see clothes and shoes in your favourite shade, with 256 colours to pick from, so you’ll always be able to find that elusive match or on-trend colour clash. Sometimes you know exactly what you want – jeans that hug you in all the right places or the perfect white tee – and you know where to buy it from. That’s why Snap Fashion allows you to browse specific brands to get a tried-and-tested look you love with minimal hassle. Of course, if you fancy a change, you can always use the Snap Similar button to find similarly shaped items and colours, which is useful if you want to subtly update an outfit or save some cash. Tseem to work together nicely?) Whether you’re deliberating whether to splurge on a new designer jacket or are curating the perfect capsule wardrobe, Snap Fashion’s Wish List feature lets you keep all your fashion favourites in one handy place. To add an item to your Wish List, you need only sign into your account and click on the heart icon next to the clothes you love. The feature works together with our Sales Alert tool to help you bag a bargain. It sends an email or push notification when that perfect Wish List piece you’ve been lusting over drops in price, ensuring you never miss a bargain again. And you can change your preferences at any time.